Launching the Galway's Gastronomic Heritage Project were Galway County Council Heritage Officer Marie Mannion, Martina Creaven, Cathaoirleach Cllr Eileen Mannion, Elaine Donoghue, Catherine McConnell, Marion Donoghue, Bernie Donnellan, Brian McNally, Christy Cunniffe, Alan Farrell, Eamon O'Donoghue and Michael Herwood. A NOVEL website charting Galway’s gastronomic heritage has been launched by the Cathaoirleach of the county, Cllr Ellen Mannion. Heritage groups from Kilerrerin [sic], Milltown and Skehana were among those to gather at Claregalway Castle for the launch of Galway’s Gastronomic History Project, which is a website that showcases a wide range of information on the gastronomic history of the region. Over 600 items have already been posted to the site, ranging from the different utensils used for cooking down through the years, to the traditional dishes of individual townlands. 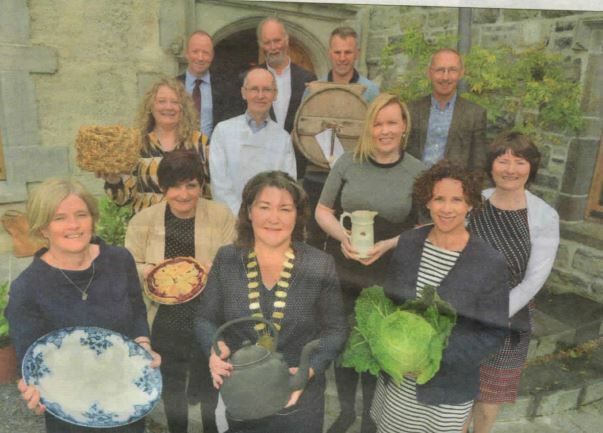 Heritage Officer with Galway County Council Marie Mannion said the forthcoming European Region of Gastronomy designation, which the city and county would take up next year, prompted the council to launch project in recent weeks. “We have about 30 heritage and community groups throughout the county from Cor na Mona to Ballymoe and Portumna to Inis OIrr, and the wealth of information and artefacts that has come forward has been very impressive,” she said. “We have gathered 427 stories relating to food and food preparation dating back to Famine times. Those behind the project intend to produce a special booklet in time for the European Region of Gastronomy celebrations that will list the 101 Great Recipes of Galway, while an interactive map on the council website shows the precise location of every story they have collected, and gives information on that area. Anyone wishing to contribute to the Galway’s Gastronomic History Project can contact Marie at 091 509198 or log on to http://heritage.galwaycommunityheritage.org.